Social Science and professional Practice Human Growth and Development. In this assignment I will explore psychological theories and how they assist in social work to better understand and work positively with clients. In accordance with the GSCC codes of practice, (2.3) pseudonym names have been used to protect the identity of the family. Robert describes his upbringing being very happy and largely contributory to him developing into a well-adjusted responsible young man. Howe (1995) believes when viewing parent-child interactions, the quality of this relationship can assist in determining the 'level of social competence and developmental pathway through life. Robert reports he was raised feeling loved, secure and trusting of his mother throughout his childhood. As Robert is hoping to become a relative carer for his siblings Camilla and Daley, it is important to acknowledge the grief they may all experience from being separated from their mother. Separation and loss can be seen in the simplest form of '...young children who are separated from their prime caregiver' (Bowlby 1973, p56). ...read more. Parents who are unable to do so risk endorsing anxious and ambivalent attachments with their children (Main, 1991). According to Bowlby & Robertson (1973) Camilla and Daley are likely to be at the 'detachment phase' given they have been in the care of the Local Authority for nearly a year and could be experiencing feelings of separation. They are equally reported to have settled in well with their respective foster carers although both frequently express their wishes to be reunited with their family and display a strong attachment to Robert during supervised contact sessions. However, should they be placed in the care of Robert they are more likely to be at fifth sequence of grieving according to Fahlberg (1991, p141) who suggests they would experience '...adjustment, reorganisation and resolution' should their placement with their older brother be successful. Whilst recognising Robert as an adult, at 18 years old it is important to identify what this means in term of him becoming a relative carer for Camilla and Daley. ...read more. with their mother during supervised contact, this must be recognised and support given for Robert to manage appropriately. It is salient to acknowledge Camilla and Daley may feel responsible for being removed from their mothers care and in order for them to feel secure with Robert, would require additional reassurance and support for them to '...make sense of their experiences' as suggested in Daniel et al (1999, p77). Attachment theory provides a valuable model in understanding relationships of families in need and promoting new and healthy attachments (Daniel et al 1999). 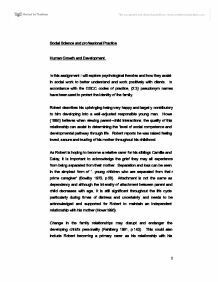 Through this assignment I have explored several theories to assist my understanding of psychological perspectives, and how they are applied in social work in assessing the role of a relative male carer for the purpose of this case study. However as Local Authority's aim to place children with their families whenever possible, there would appear to be more theories relating to the attachment children have with their parents than with siblings who they already have a positive attachment who wish to pursue the role of a relative carer. ...read more. 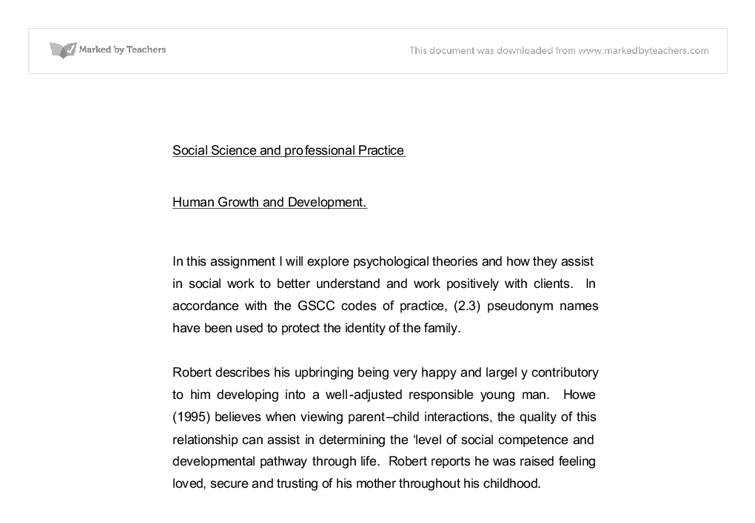 This work uses attachment theory and that of Erikson to analyse a case. There were a few ideas that needed further explanation, for example a ?disrupted attachment? ? what exactly is this? The writer also states that there are experiences which Robert has had which have formed his identity. What makes the writer think that Robert has formed an identity? In-text referencing needs some improvement, but the bibliography at the end was in the correct format. The writing style is good overall. These changes may concern their own identity or something which they feel strongly affiliated to. This model is crucial in developing a generation of youths who will confidently continue society?s development in a constructive way. It also is essential to bring out skills amongst young individuals, which are exceptional but often suppressed by disadvantaged backgrounds. How cultural heritage of clients might influence one to one counselling interaction. I will use a friend as an example, whose background is Asian, male, working-class. He was feeling anxious and depressed, and knowing that I was doing a counselling course wanted to discuss the situation with me. ( Barnes, 1995) Economic support varies between families. Both the extended and nuclear family are economic units, however, in the U.K. family members are no longer totally dependent on each other for economic survival. The state provides an economic safety net through State benefits that prevent starvation and destitution reminiscent of the past. that the " ...ethos of society is moving away from Christianity - especially teenage culture." (Cited in Lecture Pack) Basically, what that statement is saying is that teenagers and Christianity don't come hand in hand. So from that aspect the Albemarle Report was adapting a status of social control for youth workers. What does legislation say on nepotism? 7. Does legislation effectively serve as a deterrent? DESIGN & METHODOLOGY Qualitative research would be ideal for this project in the sense that I intend to conduct an archival research because it will allow me to find out enough about the perceived problem to e.g. The referral form is completed by the Youth Offending Team to indicate how the family are meeting the criteria of Every Child Matters, or not as is often the case. This enables me to recognise areas of need before I meet the family. Belief that perceptions are a major determinant of personal experience and behavior and, thus, to understand a person one must attempt to understand them empathically. 6. Belief that the individual person is the basic unit and that the individual should be addressed, (not groups, families, organizations, etc. ), in situations intended to foster growth.